Any veteran label-reader — and I count myself one of those — usually finds grocery shopping in another country more than a little challenging. After a week of almost daily visits to the store, I now feel comfortable enough when checking out to politely say, “Ne,” when the cashier asks if I have a Tesco card. I can watch the amount flash on the register display and dig in my purse without too much trouble telling the coins apart. I can stuff my cheese and rolls and yogurt into my bag with the best of them. It’s when I’m in the aisles that things get difficult. Take yogurt, for instance, plain non-fat yogurt, no gelatin, no vanilla. Certainly none of that syrupy cherry stuff. Stonyfield Plain Organic would be just perfect. But Tesco appears to have shelves and shelves of things packaged like yogurt, but much of it doesn’t SAY yogurt — or even jogurt. There’s Mi-gurt, Yogobella and Dobra Mama. Others look the same but I think are rice pudding — something to do with rice — rýžový something or other. 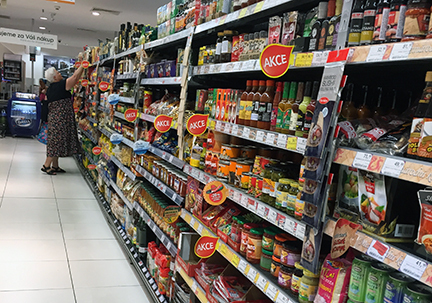 And recently I found a great expat website, “10 tips for healthier grocery shopping in Prague.” That might be tonight’s bedtime reading. But it’s not just food item packaging that gets me. My attempt at getting a small roll of something akin to Saran Wrap to keep my cheese from drying out was tougher than it would seem. The picture on the box looks OK, but the bag appears to be open at both ends and 3 meters long. 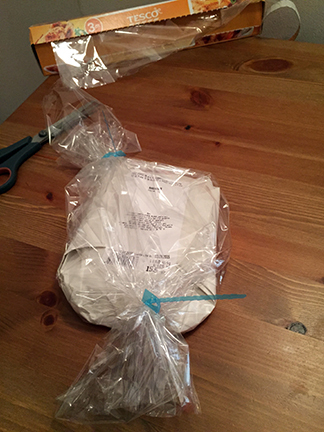 So, to wrap the cheese, I had to cut it and put “ties” on both ends. NOW I think it’s supposed to be something for cooking chicken or roast so it doesn’t splatter in the oven. But it works fine for cheese. I passed up some capers today because, even though I was SURE that’s what they were, they seemed too large I hated to risk it. Someday I’ll have an aHA moment when I’m reading a label, everything will make sense– and I’ll know it’s time to get my Tesco card. Lack of public transportation never seemed like a problem in Kent, Ohio — no buses run from our house to the Giant Eagle and even the campus is not on a bus run I could use to go to work. Still, that didn’t seem so bad. I have a car. But when the students from Anglo-American University (where I am teaching this semester) came to visit us in winter 2014, I became acutely aware of our lack. Bus or train between Kent and Cleveland? Hmmmm. Not really. The latest bus Sunday runs at 7:30 p.m., and it’s not anywhere near the Greyhound Bus Depot for someone coming in from far away. Maybe just to Akron? Yes, some, but getting info about when they run and where is a challenge. So, although I lived a while in Washington, D.C. and rode the Metro, even that wasn’t daily. 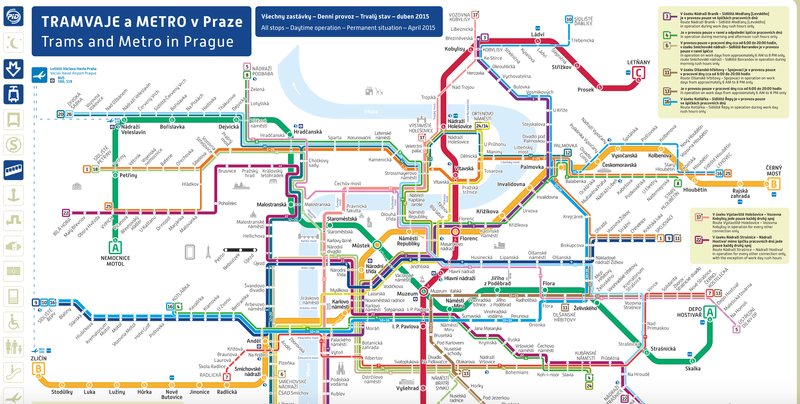 Thus Prague’s public transportation loomed huge in my mind. How do I get a tram card? Does the same card work if I want to ride the metro? Do I need to present or swipe something, like I have in San Francisco? Scan on the way in and the way out, like D.C.? Or just get on and be ready to prove I have a pass if asked? First google gave me the Dopravní podnik hl. m. Prahy (DPP) — the public transportation folks — and that mentioned places to get cards, the monthly rate and some off-hand remark about senior discounts. 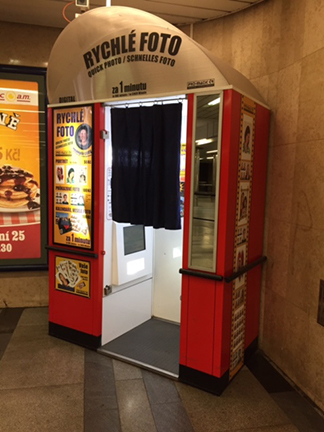 So I headed Friday to the metro station near Wenceslas Square. My half-Czech, half — OK, more than half-English conversation with the young man behind the window went well. Can I get a pass for a month? 670 CZK or about $28 — not bad. Are there senior rates? Yes. — those are free. Free??!! But you need a photo. My blank stare translated the same in Czech and English. “Over there,” he pointed, and I was on it. The machine ate one 50 CZK piece, but even at that it was a bargain. 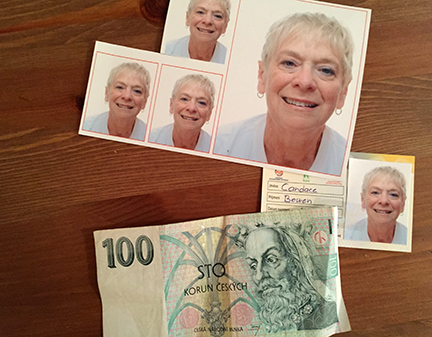 For 100 CZK, I got five lovely pics with a forced smile — the card was then free. But it worked, and after he took his lunch break, he came back and affixed it to the waiting car. Success. The next step was to use it. 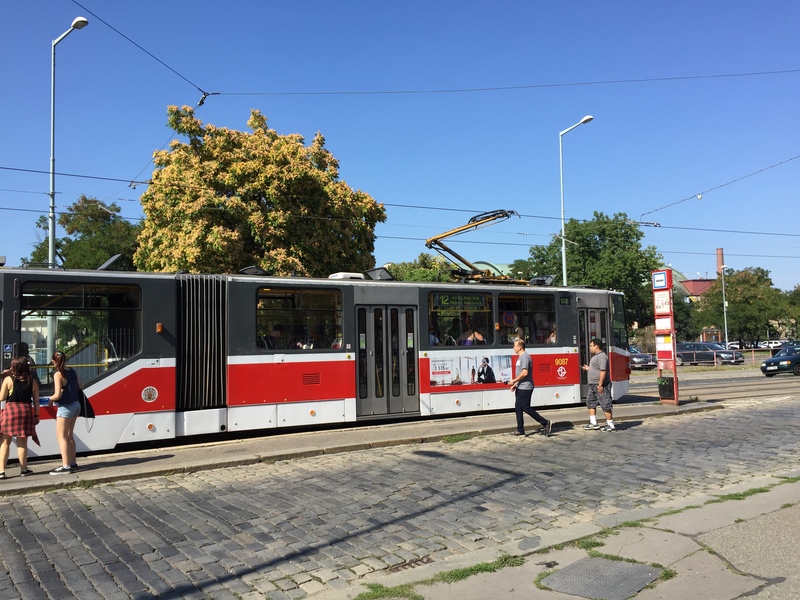 By figuring out what the tram stop name is that’s a block from my apartment, I plotted the route to the Prague Ice Cream Festival. Trams ran every 15 minutes. I didn’t count on no air conditioning — though I should have — and no windows open and the outside temp 93. But, hey, like the ice cream, I was a little melted by the time I made it there and back and now have only to figure out the subway. That’s another day. A pretty uneventful trip, as overseas flights go. But with a small dinner of vegetarian Indian curry and then missing breakfast when it arrived while I was inserting contacts during some air turbulence, my stomach was pretty empty by 3 p.m. Prague time, when I had finally finished unpacking. Two adventure options: find a likely looking cafe or restaurant and challenge my menu-reading skills or find a grocery store and plan for more than just one meal. I chose the latter. And it couldn’t be one of those mini-marts like the one across the narrow road from my apartment. I wanted choices. So I headed for the Tesco a half a mile away, according to the Google map. 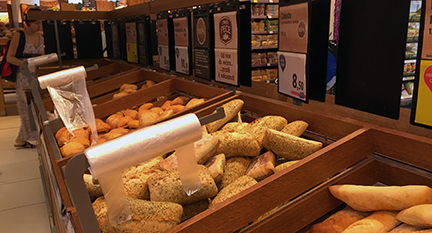 The grocery store is HUGE — and only the basement of the four-story building has food. The rest of it might be a Macy’s with a bakery and Starbuck’s tucked in the first floor. Cheese was the first thing that caught my eye — sliced Swiss — that’s easy to recognize, and when the woman in front of me ordered that, I could indicate to the deli worker I wanted just the same. “Děkuji,” I mumbled, thanking her. On to the tomatoes on sale, the green grapes (hmmm, later to discover they have seeds — did the sign say that? ), a bagel of sorts and a kaiser roll. Three things left on my mental list: bottled water, and not so heavy I can’t carry it home, butter and maybe some puopon mustard. (I may have been hungry, but I have standards.) Success on all fronts, including a small package somewhat like a baby cottage cheese container that seemed to have the same words on it as the large glass jars of the fancy mustard — horčica. And, yes, it proved to be just what I wanted in a much more appropriate size. Going through check-out is tough enough sometimes in an unknown US grocery, but when a sales clerk indicated I should do the self-checkout I hesitated. “Nerosumim.” (I don’t understand.) “It’s OK,” she said, and hustled me to the scanner. Now mind that she did it all and I would be no closer to doing it myself the next time, but it did work. Maybe that was enough grocery store adventure for a jet-lagged first day. And all it cost me was 395 Kč, which, if my rusty currency exchange skills serve me right, should be about $16. When was the last time I got out of Giant Eagle for only $16?! 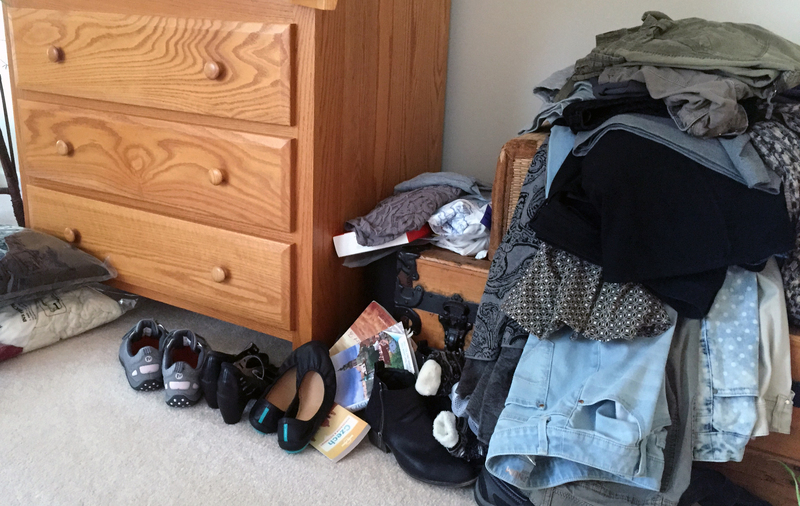 Face it — I’m a bit of a packing snob. Fifteen years of bicycle touring for three weeks at a time with only panniers and a small front tour pack taught me some valuable lessons. A USA Today article “10 tips every packer should know” made me pretty happy. I basically follow all of this advice, from rolling items to take up less space and avoid wrinkles to wearing AND packing in layers. According to Caroline Costello, SmarterTravel.com, “TSA says pack items in layers (shoes one layer, clothes one layer, electronics one layer, etc.) so the security agent screening your bag can get a clear picture of what’s inside.” That way you get through the line faster. But packing for Prague has its own set of challenges. First, it’s for Aug. 26 – Oct. 26, a sizable range of weather — from highs of 90, predicted two days after I arrive, to an average low of 36 the day I leave. That means going the compression bag route with a couple of coats and a small pile of sweaters. Then, too, I’ll need teaching clothes, perhaps “dress-up” clothes, maybe something to wear if I go with a friend who has works on an acreage on weekends. Of course there’s also just daily clothes. I have been auditioning my shoes all summer. Which are more comfortable? When I wear them all day, walking around, which didn’t give me blisters? Which could look slightly dressy or still go with jeans? Clothes, too, have faced the same scrutiny. What washes up without ironing, and what goes with lots of other items? Most important, what will be cool enough in late August and layer-able in the end of October. I also THOUGHT I should be taking toiletries to last two months so I’d have brands I like, but I rethought that when the bag with shampoo, rinse, contact solution, shower gel and body lotion weight 8.5 lbs. I think I’ll be hitting the drug store and not worrying if I don’t smell like Bath & Body Works Sea Island Cotton. The bedroom is currently a staging area with piles here and there. I know I won’t be able to bring everything I’ve pulled out of drawers and closets, but that’s OK. I tend to use the “optometrist” approach most of the time for my packing. Three different tops that go with one pair of pants — they don’t all fit in the suitcase? Okay, hold them up one at a time — are the pants better with top 1 or 2? Better with 2 or 3? Already one rain jacket was voted out of the suitcase — heavier than the other one and not as loose so more layers wouldn’t fit under it when the days get cooler. It stays home. By Monday, I’ll have a large pile of others that will stay with it. Time will tell if I chose the right things. When the syllabus arrived in my email with the Anglo-American University logo and my name as an instructor at the top, I finally realized it was true… I’m going to be teaching college students in Prague this fall. Thus my CandaceInPrague.com blog is back. Of course this didn’t happen overnight. To get a sabbatical – technically a Professional Improvement Leave – requires applying the previous fall. As 6-12.101 of Kent State’s Policy Register says, “Full-timed tenured faculty … can apply in their seventh year….” Yadda yadda yadda. And it’s not just a vacation. This must be related to the faculty member’s “professional growth and development” and “benefit both the individual and the university.” Mine will surely do all that and more. So, next Tuesday, Aug. 25, I’ll depart for the Czech Republic with a larger suitcase than I’ve ever used and an AirBnB apartment I’ve never seen waiting for me. I plan to teach “Media & Shaping Public Opinion” to 15 BA and 3 MA students, though there may be more, and we meet Wednesday nights from 6:30 – 9:15 p.m. I’ll teach until fall break Oct. 26 and a regular lecturer I met there in 2013, my co-instructor, will take over for the rest of the semester. I have a desk and work space and will be able to coach some Reporting 1 students. I also plan to conduct research about how those students decided on their course of study, similar to something I did last spring at Kent State. If we want the best and the brightest in media, we have to know how to attract them. And I expect to walk a lot and see all the things I’ve missed on previous stays in this gorgeous City of 100 Spires. When I first bicycled into Prague in 1990, not that long after the Soviets left, I knew I would be back more than once. This will be my fifth and longest stay. Let’s see what it has in store for me. Whatever it is, I’ll write about it here. Please come along on the journey.